A terrible fate awaits Martin and the other creatures who are enslaved with him, a short life of hard labor inside the walls of Badrang's evil fortress Marshank. Martin tries to think of a way to escape the clutches of the wicked stoat and his soldiers but there seems to be no way for him to be able to get out. Still he bravely fights against the oppressive cruelty of his captors and is punished for his efforts. Luckily for Martin and his friends inside the fortress help arrives when the mousemaid Rose and her mole companion Grumm arrive outside the walls of Marshank. Rose is determined to free her brother Brome who is also one of Badrang's prisoners. Soon Grumm is doing what moles do best and at least some of the prisoners are free, including Martin. For Martin however, this is not enough. He is resolved to free all the prisoners and also he has sworn to make Badrang pay for all the suffering he has caused. It was Badrang's corsairs who captured and enslaved Martin and who were responsible for the death of his much loved grandmother. Badrang also stole Martin's sword, a great weapon that Martin's father left in his keeping. Soon Martin and his friends are caught up in a deadly battle of wits with Badrang. They also clash, first one side and then the other triumphing. Badrang's situation is made more complicated when an old partner in pirating arrives asking for a favor. When Badrang refuses to accommodate Cap'n Clogg, he soon finds himself fighting on two fronts. Brain Jacques has once again created a story which is gripping, sometimes disturbing, and often moving. A love is lost, friends are made, and heroes are created aplenty. We are left understanding better why Martin the Warrior was such a special mouse, and able to appreciate him all the more. 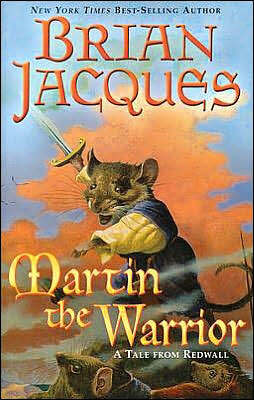 For Redwall fans this book answers a lot of questions about the famous Martin, the little mouse who becomes the warrior of Redwall and who guides its creatures in times of trouble long after he is gone.